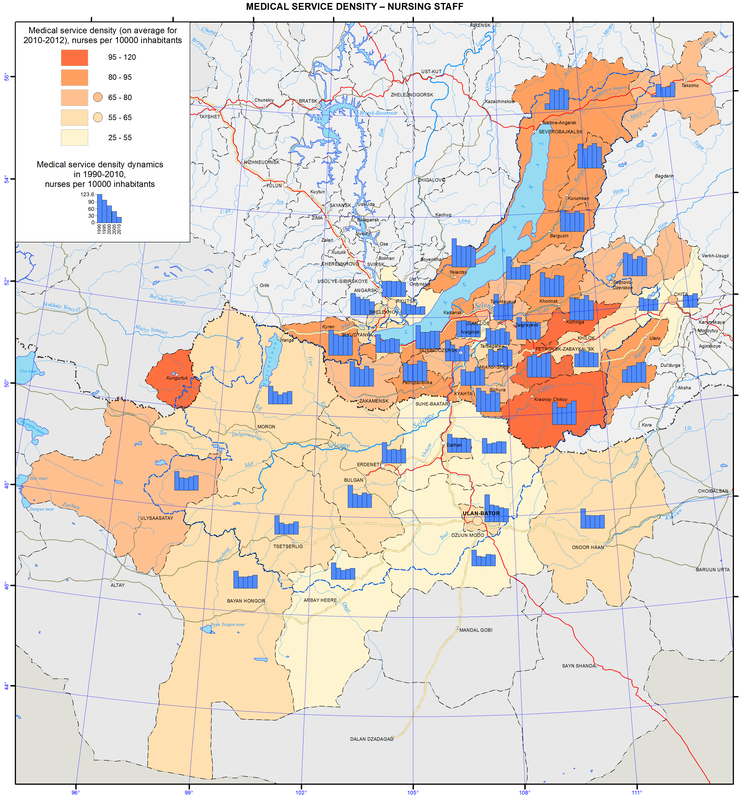 Harsh climatic conditions across the entire territory of the Baikal basin and the surface and ground water used for drinking and food purposes that do not meet the drinking water quality standards (first and foremost in Mongolia and Buryatia) coupled with atmospheric emissions from industrial facilities and motor vehicles (in some parts of the territory) are responsible for the state of human health influencing the organization of healthcare. The ecological situation becomes substantially worse during winter months, which is encouraged by the topography of the terrain. In Mongolia, the spring period is very hard time to bear, with sharp temperature differences, abrupt variations in atmospheric pressure, and frequent dust and magnetic storms. The organizational pattern of healthcare in Russia and Mongolia has much in common. This is a result of the cooperation of the two countries in this sphere and the fact that medical education and healthcare in Mongolia are organized using Russian experience. Today, Mongolian medical facilities operate on the principles of the state-private partnership concurrent with the demonopolization of the state system of medical services. The country has a mandatory and voluntary medical insurance system, in which state-owned and private medical institutions take part. The country also has various health institutes and centers. The territory of the Baikal basin is experiencing a deficit of medical workers. As of 2012, the availability of physicians varied from 13.8 to 30.1 per 10,000 people in Russian districts and from 16.1 to 29.0 per 10,000 people in Mongolian aimags. The availability of nurses varies from 25.1 to 112.2 per 10,000 people in Russian districts and from 26.4 to 38.2 per 10,000 people in Mongolian aimags. In Ulan-Ude, these indicators have the values of 53.9 and 117.3, while in Ulaanbaatar – 44.1 and 41.2, respectively. The ratio of doctors and nurses in the Russian part of the basin is between 1:2 to 1:4, while in the Mongolian part it does not exceed 1:2. The World Health Organization (WHO) recommends that this ratio should be 1:4. A narrowing of this indicator causes imbalances in the healthcare system thereby limiting possibilities for further development of the after-treatment, casework and rehabilitation services. Target indicators of healthcare activity are the standard volume of medical care per inhabitant. Currently, there are plans to decrease the per capita volume of in-patient services and increase the per capita volume of the hospital-replacing care. Accordingly, the number of hospital beds available 27/7 will decrease, while the number of beds in day hospitals will grow. Overall, the available number of hospital beds complies with the calculated standards and meets the demand of the population for the in-patient medical aid. As of today, in Russia, there is an array of problems relating to the high level of illnesses and disability incidences among the population, and these indicators are continuously growing. Such a situation is the result of inadequate preventive measures. Another important contributing factor to this situation is the increase of the proportion of elderly population and the improved effectiveness of illness detection using new diagnostic methods in the process of the increased number of medical checkups. The leading illnesses in the structure of morbidity are respiratory illnesses, bloodstream, eye, and digestive and musculoskeletal system diseases, as well as traumas. For many years, circulatory system diseases, neoplasms, and injuries have been the main causes of mortality and disability among the population. A complex of anthropogenic environmental factors contributes to the growth of morbidity and disability rates among the population with the most important one being air pollution. According to the WHO, atmospheric air pollution is the cause of up to 23% of all illnesses. The amount of pollutant emissions in the atmosphere produced by static sources in different administrative divisions in the Baikal basin differs by more than a thousand times. The most polluted air in the Baikal basin is in the Selenginsky district of Buryatia. The health of the population and further development of healthcare depend on ecological, social, and economic factors. These problems can be resolved only through comprehensive approaches to the improvement of the quality of life of the population. The strategic goal of the healthcare systems of Russia and Mongolia is to build a system, which ensures the quality and accessibility of medical services, primarily first aid, and increases the efficiency of medical services, based on the improvement of territorial planning of healthcare. The volume, types, and quality of these services should correspond to the rate of morbidity, population requirements, and the latest achievements of medical science, based on perfecting the system of territorial planning of public health services.